Before your first coding practice, and before your long steps to the PIC programming, you have to check if you have everything you need. You don't want to stumble at the start line and you don't want to see your PIC engine fizzle out. Basically, you need four (4) things : (1) a PIC board - commercially available one or your own breadboard, (2) PIC burner - which downloads your code (or your bootloader code), (3) Bootloader code which you download to your PIC chip using the burner so that your application code can be downloaded without using the burner anymore, and lastly (4) a Windows program to actually download your code. Of course, you have to have PIC assembler, and you can get it free from Microchip web site. The exact name of the assembler (which comes with editor, assembler, and simulator, among other amenities) is MPLAB. Check my PIC Start-up page for the detailed explanation for (1)what minimum hardware you have to have for your PIC project, (2) how to select a proper 16F877 or 16F877A chip for the project, (3) where you get a bootloader, (4) where you can find a PIC burner to burn your PIC16F877 or 16F877A bootloader, (5) where you can download the Windows-based PIC downloader program (which downloads your own hex code to the bootloaded PIC chip), and (6)other important stuffs you have to check before ignite your PIC engine - a must read for all beginners. Chapter 4 of the book describes step by step for this coding environment with sample codes. About the Author: Dr. Charles Kim is a professor in the Department of Electrical and Computer Engineering at Howard University in Washington, DC, USA. He has taught for years both for undergraduate and graduate students at many universities including Texas A&M University, University of Suwon, and Howard University. 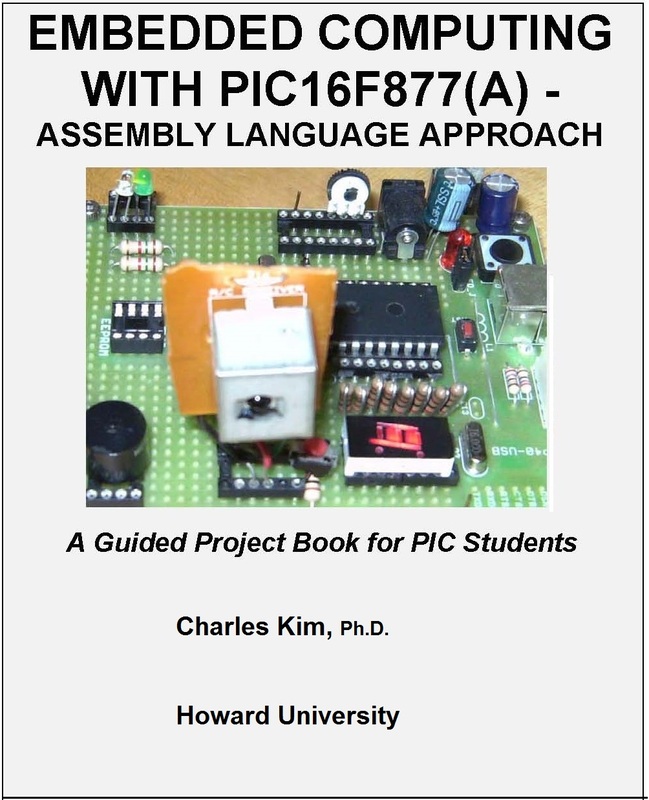 Dr. Kim wrote this book originally for his Microcomputer course and Embedded Computing course, and currently this book is used as the textbook of Embedded Computing, which is basically project-based robot building course. It was also adopted for the Microcomputer course for assembly language programming. His approach in the book is simple: code in assembly language, which is free, instead of using C which costs you with cross compiler. Dr. Kim is active in embedded computing, smart sensor network, and AI and machine reasoning systems. 1. Chapter 1: Introduction Very skimpy introduction of 16F877. I thought a lengthy one waste of time or a little insulting to readers who I think are already exposed to the microcontroller. But everybody writes introduction, so I am kind of caved in by the peer pressure, and have my own introduction here. You can skip it without any loss. 2. Chapter 2: PIC16F877 Microcontroller - Overview This chapter is to shake loose your muscle as a relief pitcher does to record another save. This time it's one for PIC16F877. You learn about the architecture, pin and package, and block diagram that you can forget after the shake. Many things are done in hardware level, in which programmers bother to meddle with good hardware designers. The structure of program memory (RAM) and where special registers are already occupying in four different banks are important. Also important is where the empty RAM spaces ("file register") are located for our use. They are actually scattered in 4 different banks. Then we discuss how input and output ports are controlled to be used as input or output, with example codes. Very simple LED turn on and off code is presented to apply the I/O configuration. That's all, folks! 3. Chapter 3: Instructions Sets details PIC16F877 instruction sets. Bit- and byte-oriented instructions are explained with detailed examples. One example seems more effective than 1 page description, in my humble opinion. Instruction cycles and their period are briefed. Then, I add several tricks of using the instructions. The reason why we need tricks is that, first of all, PIC is centered around "peripheral", which means PIC is very good in dealing with inputs and outputs. But we are trained to calculate something using the instruction (PIC) which does not have much calculation instructions. We want to declare a variable as we do in C, like "long x", but how do we do that in PIC? How do I check if a certain bit in a byte is set or cleared? How can I check if an input from a motion detection sensor goes to zero or stays in high? Do we have DO loops or FOR loops or WHILE loops in PIC? How can I change the blinking frequency of an LED without using whatever is built inside PIC, I mean, using just simple instructions? These are the tricks. Every bit genuine, though. 7. Chapter 7: Motor Control and Robot Project The subject sounds very heavy but controlling motors, whether DC, Stepper, or whatever, is rather light. Here I focus on motor control method of different type of motors. Then, I introduce motor control chips, which you can easily obtain (buy or get free as samples), and how to use the motor control chips to control the motors. The main point is to tell you how to send command to the chips, as we send command to IR receiver or a small guy like an LED. That's why motor control is such a small matter, according to me. One may think a stepper motor is in the different league. Well, there are stepper control chips, whether your stepper motor is unipolar or bipolar, which send a command for you to step around for a flamingo or samba. Several chips are introduced along with connection diagrams and example codes. So robot making does not seem too difficult after working on this chapter. If you are building a heavy-duty robot, like a battle-bot or a delivery robot, do not use the suggested chips: instead, buy a motor control panel/board and control it with your PIC. Anyway, from this chapter, you can make a thing which can move. With IR on top, you can even remote control your thing. Great, isn't it? [Example code for unipolar stepper motor control with ALLEGRO UCN5804 chip]. 14. Chapter 14: SSP (Synchronous Serial Port) Module and I2C Bus for External EEPROM (24LC16B -16K) Access I2C (Inter-IC) bus is very popular, particularly in home electronics products, TV, VCR, etc. The reason is that connection between processors needs only 2 or 3 lines, unlike 8 or more lines in the traditional internal bus configuration. I first discuss about the I2C bust and its protocol, and I guarantee that you hate this part. Complex and complicated. But I try to cut and untangle this mess. Then, we apply the I2C bus to a serial EEPROM which we connect to PIC. This serial EEPROM should not be confused with the small size internal EEPROM. The serial EEPROM we attach to PIC is 24LC16B which is 16K bit sized. If you have a lot of data to store and play around, this project is worthy of try. But mind you that it's complicated. But just follow my instruction and coding example. [Example Assembly Code: I2C Master Mode Program for use in 24LC16B Serial EEPROM access by 16F877]. 15. Chapter 15: Armatron Control Armatron is an old technology, and chances are you have not heard about it. A few decades ago, this one came out with robotic arms on wheel. This chapter explains how to control the Armatron with your PIC alone. Simple relay control commands the Armatron to work: forward and reverse move, turn, pick up, etc. An IR receiver and a TV remote allow you to remotely command this antique. A student of mine cruises through this project with no sweat. You can do, too. 16. Chapter 16: Digital Control using PC with IR This project is interesting. We still use the subject of IR, but here IR is not just for reception, but transmission too. In other words, there are decoding and encoding of IR command involved using MC145026 (Encoder) and MC145027 (Decoder). Put simply, you can make your own remote controller. This project combines the IR reception and IR transmission via your computer for any simple control application. Another thing introduced here is a Windows based visual basic code for Windows interface for the command of IR. Provided are hardware description, details of complete code, and Visual basic code for Windows programming for serial Communication with 16F877. How to get this Book in electronic format [475 pages,6.5 MB in pdf] ? Donation of $20 will get you the electronic book and the entire codes in the book. NOTE: This Book is for personal use only; therefore sharing of it or its part or intending to share it or its part in any form, private or public, is prohibited. Why am I asking for donation of $20? *NOTE: Some slides of the above chapters may be found in the links: ucF08, ucF09, and EMBedded.